Both the dog’s name and the rustle of the treat bag are cues. One you may have taught on purpose—though the dog may not have learned what you thought you were teaching. The other you probably taught by accident—but you did a better job than you know. A cue is a signal in the environment that tells the animal reinforcement is available for a certain behavior or sequence of behaviors now. “Commands” from you can be cues, but all cues are not commands. In fact, the great majority of your dog's cues come from the environment, not you. Thirst might cue the dog to walk to the toilet. A closed lid on the toilet might cue the dog to walk to the water bowl. An empty water bowl might cue the dog to bang the bowl with a paw. A reinforcer is anything that, as a consequence of behavior, increases the future probability of that behavior. But how often is that true? What percentage of the time does your dog’s name predict a treat, play, access to the outdoors, petting of a sort your dog genuinely loves, or other great reinforcers? What percentage of the time does your dog’s name predict the end of play, the end of digging, losing sight of a squirrel, being grabbed abruptly by the collar, kennel time, departure time, a nail trim, a squirt of ear cleaner, petting of a sort your dog doesn't like, or just nothing in particular? Estimating these ratios will give you a pretty good picture of the current reliability of your dog’s response to his name. And you can apply this same math to figure out how reliable any other cue is. The "math" is a crude version of the Matching Law, which essentially says animals exhibit behaviors in proportion to how much reinforcement has been available for those behaviors in the past. Now: About what percentage of the time would you say the aforementioned rustle of a bag predicts the dog will get food? So what can you do to increase the chances that your dog will respond to a his name the same way he does to the rustle? Make sure your cues predict an outcome that your dog will really look forward to. One could argue more broadly that the answer is to ensure your cues predict enough reinforcement to make the behavior "worthwhile" under a variety of conditions—be that reinforcement cheese or avoidance of punishment. But ethical trainers try very hard to teach dogs using stuff they will work to get, and using stuff that evokes joy has the additional benefit of creating joyful associations with both behaviors and the cues that signal them. Does your dog just mechanically walk over when you rustle the bag? Or does he bound over with soft eyes and a broad tail wag and his mouth lolling open, maybe a drop of drool on his tongue? When you give your recall cue, you want that look to come over his body as soon as he hears it. Jettison cues that have poor predictive value, that have been weakened by overuse or poisoned. Replace them with new ones that are more reliable predictors of reinforcement. You probably don’t want to change your dog’s name—I don't either, though frankly I'm human, and so it's my least effective way to get her attention. But do be aware of, and try to bolster, its relationship to reinforcement, and then maybe teach another cue, a fond nickname or a "secret password" that you’ll use when you need a more reliable response. Even then, though, there are still obstacles to reliability. Let’s take one of our own strongest behaviors: stepping on the gas at the sight of a green light. For experienced drivers, it feels like the most "automatic" of responses. But it's still a choice, and there are still times when we will choose to do otherwise. First, you have to be able to perceive the cue—which you might not if you’re texting (stop texting! ), squinting into the sun, or trying to retrieve the Cheez-It you dropped into your crotch. What’s more, there may be competing cues in the environment—say, an adorable dog on the corner, or a witless pedestrian in the middle of the crosswalk. When you call your dog’s name, and he doesn’t respond, it coule be that he isn’t sure what it predicts, or there are competing cues in the environment, or both. Hey, Dad’s calling my name over there, which could mean a biscuit, a bath, or nothing at all, but the strong scent of rabbit poop right under my nose is heralding the taste of rabbit poop, so . . . no contest. Such hurdles can be largely overcome by anticipating and building tolerance for various competing cues into your training. If your dog can respond enthusiastically to his name at home, master it in the yard. If you’ve mastered it in the back yard, work the front porch. Take it on the road, and move it on down the street. Work it far away from rabbit poop, and then work incrementally closer. The point of training a recall cue is to be able to call your dog off a potentially life-threatening distraction. But during training, train—don't test (a mantra I came across while reading an article about gundog trainer Mike Stewart a couple years ago and immediately stole). Set the dog up to earn reinforcement over and over again, because (remember our definitions?) it's what strengthens future behavior. Don’t bother giving the cue when you won’t be able to make it pay off for the dog; don't turn your cue into another signal that means "maybe she will, maybe she won't." And reinforce most generously when looking at you costs the dog access to something else really great. I imagined any professional dog trainer would just have a mental catalog of predetermined responses for various situations: When the dog does this, you should do that. If he does that, you do this. It would be a couple more years before I really understood this answer, and I’m not sure I truly, deeply grokked it until my interest in dog behavior led me into the broader field of applied behavior analysis. Antecedents are signals in the environment that tell the animal a given behavior is likely to produce reinforcement now. Consequences are outcomes that make the behavior more or less likely the next time the same circumstances arise. Behaviors that produce desired consequences will be repeated, and antecedents that predict desired consequences for a given behavior will become cues for those behaviors. To change behavior, we have to adjust these environmental conditions. Yeah, yeah, you say. I get it in theory—but my puppy is biting my hand right now, and it hurts like a motherf@#%er. I have to do something, don't I? First, identify the behavior—just one, and just the facts, no interpretation or implied motive. PREDICTION: When I reach for the collar, the puppy will continue to put her teeth on my arm in order to make my hand go away. We don’t know why this hypothetical puppy wants my hand to go away. 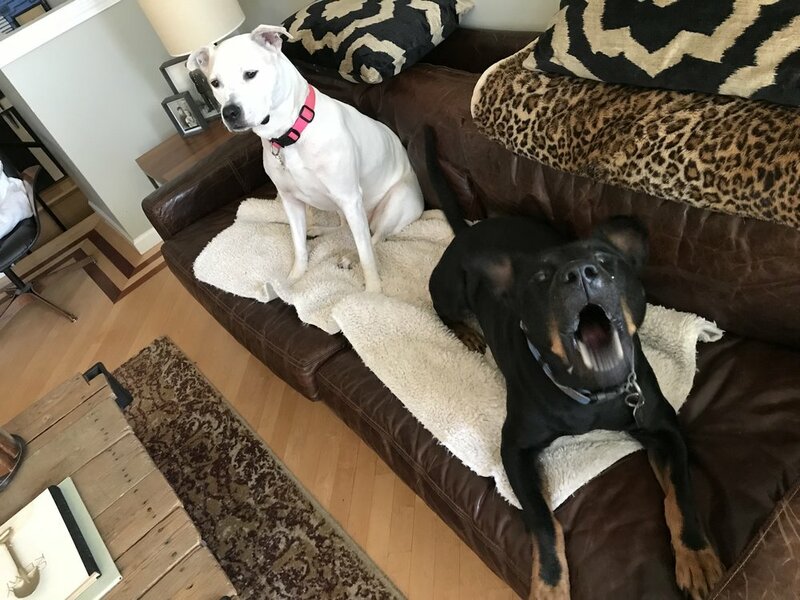 We don’t know if she’s “angry” (a label often used to describe a group of behaviors that people with better understanding of dog body language might call “scared”). It’s unhelpful to speculate whether she is “dominant.” But with just the observable facts, we can make a plan and test our hypothesis. There are lots of variables in this simple-sounding process. For instance, if the puppy is extremely uncomfortable being reached for, we might have to break it into small steps, only reaching partway toward the collar at first. The treats need to be something this particular puppy really values, not just something that came in a bag labeled TREATS. For one puppy, I might be able to just catch her looking forward before she turns toward my hand. For another, I might prompt the new behavior more explicitly to start, say, by presenting a treat right in front of her nose as I reach in, until she starts to anticipate that it will be there. Over time, the puppy can also learn that me reaching for the collar predicts me clipping the leash on, which predicts a walk. At this stage, if the puppy finds going for a walk reinforcing, treats can be faded out. PREDICTION: The puppy will bite my arm more often when I am working on my computer. The function of this behavior is different from the function in the previous example—and thus it best assessed as an entirely different behavior. The first time your puppy bites your arm here, she probably isn’t requesting a squeaky. But behaviors that start with one function can easily acquire another. Sitting is not the behavior dogs naturally do to get food. Yet most pet dogs, even if you’re barely making an effort to train them, will somehow learn to sit to acquire food. Think about that—what animal, in the wild, sits to get food? In this case, your solution should acknowledge that a puppy needs lots of legal stuff to do with her mouth. So you can still direct her to a toy, but timing matters: Take your arm out of play right away, without a lot of fuss, and then watch for a moment or two of some other behavior that you like better. Then present the toy so that it not only satisfies the puppy's need to chew or play but also reinforces that bit of more desirable behavior. Limit the ways in which she will be able to "ask." For example, you could confine her to an exercise pen near you during computer time, with plenty of legal options for chewing and play, but zero access to your pants. Think of the pen as training wheels: she can ride the bike, but she can’t fall over. When she’s developed good riding habits, you can take the training wheels off. Note: This is a place where standard "tips" can really go awry. The behavior here doesn't have to be a sit—and maybe it shouldn't be. Sitting might be hard for your individual dog, because it hurts his hips or because he's too excited or because the surface near where you use your computer is slippery. Standing, lying down, or doing an adorable head tilt might be acceptable or even preferable ways of making this polite request. For more on how to select alternative behaviors, see my columns When Sit Doesn't Happen and Training With the Grain for One Tail at a Time.